Bret T. Howrey et al. A team of researchers from the University of Texas have recently had their findings published in the journal Gerontologist. 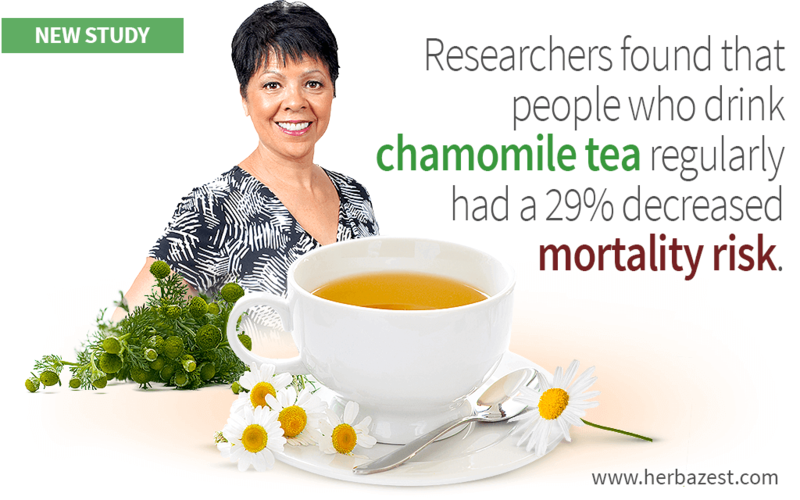 Their research indicates the positive impact of chamomile tea on mortality, specifically in Mexican-American adults. Given the popularity of herbal teas in the population as well as the lack of scientific data available on their health impact, the researchers wanted to find out more about the potential benefits of chamomile (Matricaria chamomilla) for longevity. The study included men and women of Mexican origin over the age of 65 and was carried out between the years of 2000 and 2007. The participants were taken from five different states: Texas, California, New Mexico, Colorado, and Arizona. As chamomile is a widely-used medicinal herb, particularly in the form of an infusion, it was of interest to the researchers because of the prevalence of this remedy in Mexican culture. The study used previous data from the Hispanic Established Populations for Epidemiologic Study of the Elderly, and included 1,677 adults, 14% of whom drank chamomile tea. What Came Out of it? The results obtained were interesting, as it was found that those regularly drinking chamomile tea had a 29% decreased mortality risk in comparison to those who did not drink it, but this only applied to women. These findings held true even after an adjustment for other variables, such as health conditions and lifestyle factors. The reasons behind this remain unclear, but it is thought that women drink chamomile tea more frequently than their male counterparts, which could explain the disparity. The study shows the health and medicinal benefits long associated with chamomile hold true and may be more extensive than first realized. However, the study was a very preliminary step in the research of the herb, as it was conducted on small numbers in a restricted area and only on one ethnicity. It also did not manage to explain the reason behind the apparent link between drinking chamomile tea and a reduced death risk, or the anomaly of it only applying to women. Perhaps would be a good idea to start building the good habit of sipping on a warm chamomile tisane every day, alone or mixed with other beneficial herbs, like this soothing basil infusion for headaches.